PHOENIX – On the outside, Toso’s Bar and Grill in North Phoenix looks like your typical sports bar right off the highway. But step inside and you feel like you are in a sports bar in Boston. With New England Patriots memorabilia covering the walls, it’s a home away from home for many Patriots fans who live in the Valley. 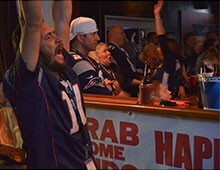 A crowd of more than 300 Patriots fans gathered at Toso’s Sunday night as the Patriots clinched a spot in the Super Bowl with a 45-7 win over the Indianapolis Colts. Many were decked out in a wide variety of jerseys, from old favorites like Tedy Bruschi and Ty Law to modern day stars Tom Brady and Rob Gronkowski. Seeing your favorite team clinch a spot in Super Bowl XLIX is a special achievement. But watching your favorite team advance to Arizona makes the win even sweeter. “It’s a dream come true,” said Katie Mackay, a Massachusetts native who moved to Scottsdale more than a decade ago. Mackay is one of many local Patriots fans part of the New England Patriots Fan Club of Arizona. Like many attending Sunday night’s watch party, she has already made plans to attend the big game. She has put down a $1,000 deposit towards tickets. The day before the big game, the fan club is planning a big rally with some special guests. One possibility: Patriots owner Robert Kraft, who showed up before the 2008 Super Bowl also held in Glendale. The club was established in 1997 and has more than 300 paying members. As an officially recognized fan club of the team, they work with the Patriots on charity events. Some club members come from Massachusetts, New Hampshire and other parts of the Northeast but the team has also brought in fans from around the world. Omar Bay moved to Phoenix five years ago but went to school in Massachusetts after moving from France. He became a Patriots fan while in school and brought his fandom with him to the Valley. As the game went on, there was little doubt in the outcome. “We’re confident. 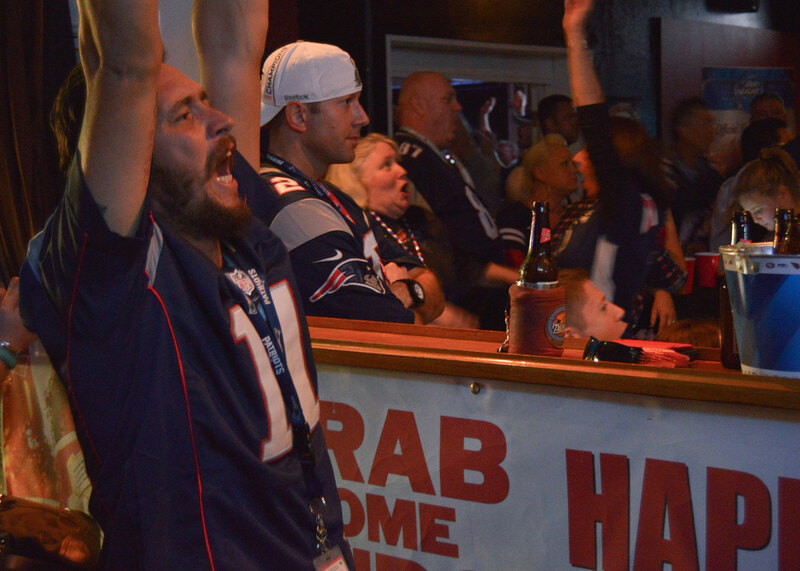 We’re very confident that we’re going to win,” said Chris Micklovich, who has attended official watch parties at Toso’s for the last eight years since moving from the Boston area. As fans prepare to welcome their team to Arizona, many are hoping for a better result than the last time the Patriots played a Super Bowl in the Valley. In 2008, New England came into the Super Bowl with an 18-0 record but lost to the New York Giants 17-14 in one of the most memorable Super Bowls in history. Mario Walter celebrates one of the Patriots' six touchdowns in their AFC championship win.